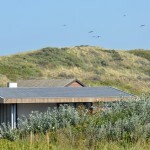 Set on the Dutch island of Vlieland, this small holiday home features a fully retractable façade that allows it to open up to the outside environment. 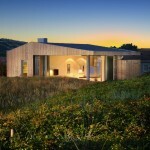 The house has been designed by architecture studio Bloem and Lemstra Architects on the behalf of a client. The zoning in which the holiday house is placed is quite strict. It was permitted to create a new house that was up to 54 square meters in size and no higher than 2.5 meters. A smaller addition, up to 6 square meters, could also be added to the house. In this case they used this allowance to build a separate entrance. The architects settled on a simple design: the more private areas of the home would be located on the north side of the building, and the shared living areas would take advantage of the island views to the south side. Hence the bedrooms and bathroom are found at the back end of the home, and the open plan living area to the front. The small footprint and overall building height help the holiday home to reduce its visual impact on the landscape, and the timber siding gives it a softer aesthetic than other cladding types. Elements of steel are also on show, mostly towards the front where a steel column that supports the roof has been left exposed. The interior is light and airy (particularly when the glazed façade is retracted). The floor level between the interior and exterior areas is maintained creating a seamless transition between inside and outside. The open plan living area is taken up by the living room, kitchen and dining area. The back end of the house features 3 beds within two bedrooms. The bathroom, like a Japanese bathroom, features a toilet and shower that are accessed individually. The separate entrance provides a means of accessing the home during the colder winter months, without losing heat from the main building.